This is the essence of LabMaster. A student in lab runs this toolbar application which merrily sits at the top of the screen (where there would normally be blank regions of application title bars) and does nothing until the student needs help. Clicking the "Question" button makes it drop down (the white space in this image would normally be occupied by whatever application occupies that part of the screen). The toolbar then continues to do nothing until the student clicks "Question" again, causing it to retract. What could be simpler? The entire purpose of this is that the student can then continue working in the background until a TA is available to help. What's more, the Toolbar can show more than one button. If two different classes have help sessions in the same room, the Toolbar might offer a button for each ("CS-008 Question" and "CS-021 Question" perhaps). So how do helpers figure out who's clicked their button (short of walking around looking at everybody's screens)? Using the LabMaster Map! A TA can run this program from any computer (ideally one that can project it onto the wall) and see at a glance who has questions. This map shows all the seats in the lab (in this case the lab is laid out in two big arcs with a few seats in front and on the left). Green seats are those occupied by students in lab. The red seat is a student with a question. The other seats are either unoccupied or are being used by people who aren't participating in the lab. What if you don't like the color scheme (or, more importantly, are color blind)? That's not a problem. The map is built in layers that are highly customizable. 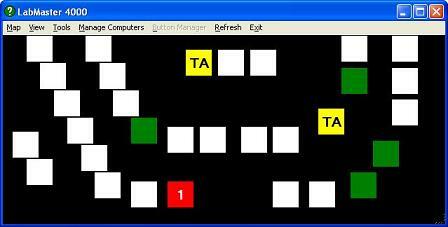 The map shown here has a "Helpers" layer that shows where TAs are sitting, set to show in yellow with the string "TA." It has an attendance layer set to show in green. It has a layer showing all questions in red with a sequence number, and with the first two questions flashing in order to call attention to them (so the next two people waiting for help will have flashing seats). Someone who doesn't like flashing or can't distinguish colors can use text labels to distinguish layers or just only show one at a time.